AzhwAr says that to be subservient to emperumAn is nothing but not rejecting him when he comes to shower his mercy on us. Nobody can estimate his greatness, he says. pErE varap pidhaRRal allAl – Not saying something or the other, other than reciting emperumAn’s divine name and making this as a habit. Has it not been divined by kulaSEkara AzhwAr in perumAL thirumozhi 2-4 “nAththazhumbezha nAraNA enRazhaiththu” (speak out emperumAn’s name of nArAyaNa till scar forms on the tongue)! Just as the elephant gajEndhrAzhwAn called out to him, even if in a disorderly way, such that emperumAn came hurrying to the bund of the pond where gajEndhra was caught by a crocodile. em pemmAnai ArE aRivAr – who can know the entity who is my Lord? AzhwAr knew about emperumAn since emperumAn himself manifested to him. adu niRka – let the enquiry into who can know wait for some time. nErE kadikkamalaththuL irundhum kANgilAn – Let us see who did not know him. 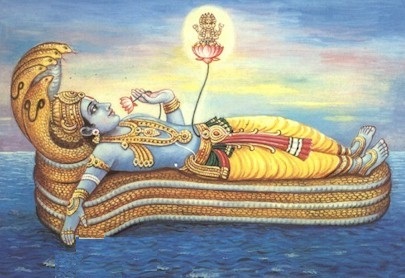 Even brahmA, who was born in the fragrant lotus which shot off from emperumAn’s navel and made that itself as his dwelling place, who has the greatness of having been taught all the vEdhas (sacred texts) by emperumAn himself, has not seen the divine feet of emperumAn despite being so close to him. kadikkamalaththuL irundhum kANgilAn – are they so difficult to see? Yes, just as one cannot estimate the depth of an ocean by building a house near the shore and staying there for a very long time. At the most, one can know that it is not possible to know. In SrI rAmAyaNam yudhdha kANdam 120-3, it is said of brahmA “brahmA brahmavidhAm vara:” (brahmA is the greatest among those who know brahmam (supreme entity)). Thus, if the most knowledgeable brahmA himself does not know emperumAn, is it possible for others to know? AzhwAr says that when vEdham itself says that unless emperumAn comes and shows himself up, it is not possible for anyone to know him. Let us take up the 57th pAsuram next. This entry was posted in iyaRpA, mudhal thiruvandhAdhi on August 5, 2017 by T N Krishnan.